Feedback has been developed so that we can keep you updated on how your views are helping us to shape, plan and develop the NHS services that the hospitals and other NHS organisations provide. We also aim to keep you informed about upcoming engagement opportunities. We know from you that some people want a brief update while others want further details. Each section of Feedback therefore provides a brief overview together with links or contacts for further information. Local partners are reassuring people living in and around Dorset that they will be working hard to deliver the best possible care over winter, at the same time reminding them that they can help both themselves and local services by being prepared and using the most appropriate service when they need help or advice. Activities helping to improve the health and wellbeing of those in later life, including people with dementia and their carers through nature are now being delivered in Dorset. 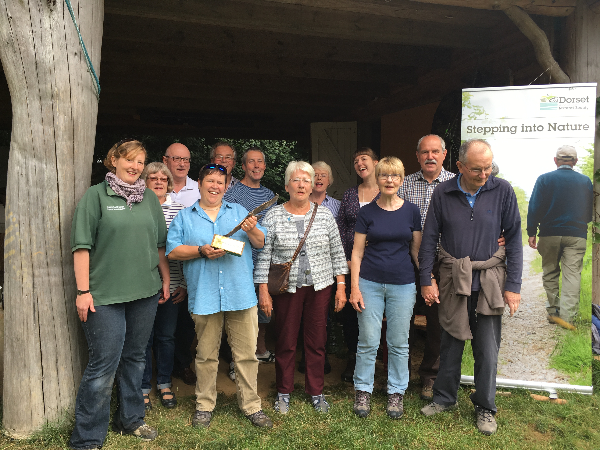 The project, Stepping into Nature (Si2N), is a three-year £320K Big Lottery funded project, led by the Dorset Area of Outstanding Natural Beauty team and hosted by Dorset County Council. Si2N aims to improve health and wellbeing and reduce social isolation by helping attendees experience and enjoy Dorset’s outstanding coast and countryside in a fully supported and friendly setting. All activity leaders are fully trained and experienced in working with a range of audiences. This is an invitation to be part of one of three teams made up of people with wide-ranging experience of elective care who will be joining forces over 100 days – between December 2017 and April 2018 – to design and experiment with ideas and innovations to help improve quality of care in Dermatology, Diabetes and Ophthalmology in Dorset. If you are interested in taking part or would like more information please contact us via [email protected] Please note the closing date for expressions of interest is Friday 15 December. Wessex Voices and Healthwatch Dorset are hosting a conference to bring together people with an interest in GP Patient Participation Groups (PPGs). The event will be open to anyone who would like to learn more about how the groups work, their importance, and how they fit into the bigger NHS picture. Places at the event will be limited. If you would like to register an early interest in this conference please provide us with your contact detailshere. The Royal Bournemouth and Christchurch hospitals’ Change Champions have won the Health Service Journal’s (HSJ) award for Staff Engagement for their work on culture change in the Trust. The Change Champions first got together in 2015 to improve the working environment for staff and empower them to provide the best care for patients. Their work has included listening to staff about how they want to be recognised, which led to the first #ThankYou! Day, attended by more than 1100 members of staff; introducing a simplified and inclusive approach to trust objectives and bringing in a new training programme on customer care. Have you heard of the Bournemouth Local Offer? Do you look after a child with special educational needs or disabilities (aged 0-25)? The Local Offer is a wide range of information, support and facilities that you can expect to find in your local area. Why not take a look and tell us what you think? As part of a series of events at Poole Hospital, consultant microbiologist Dr Liz Sheridan helped to raise awareness of the importance of using antibiotics appropriately during World Antibiotics Awareness Week from 13-17 November. This year’s tour programme included theatres, the cardiology department and the equipment library. There was also the opportunity to take part in the popular CPR challenge, and the Practice Educators demonstrated their training aids. At the CCG we regularly use our social media channels to put out information about upcoming events, health issues or promotions, and also help distribute messages from our partner organisations, i.e. local hospitals or the local Ambulance Trust. If you use social media you can get involved by following us on Twitter or liking us on Facebook. By doing this, our latest news will be displayed in your timeline. If you are new to social media there is helpful information available on the BBC website about how to get started. Assurance has to be provided on how as an organisation, we are meeting the values, rights and pledges made within the NHS Constitution. The NHS Constitution’s aim is to safeguard the enduring principles and values of the NHS, setting out the responsibilities of the public and staff and enabling public, patients and staff to know and exercise their legal rights.